If wacky had a middle name, it would be Mohodisco. However, unlike other odd incarnations, this band keeps its goofiness in check. To be more precise, it's much too melodic to be considered avant-garde. Each abnormality is too well-timed and just too witty to be thought of as random anomalies. You will find every rhythm, solo, and riff to be utterly insatiable. The only instrumentalist who consistently appears in all these cuts is Bruce White. His guitars catalyze the rest of the crew's creativity. In this science lesson, experimentation is encouraged and musicianship is the trigger. With every class, the attendance changes as we find anywhere from one chemist to six adding their own elements to the brew boiling inside this cauldron. The winning bet consists of a calculated trifecta. Brian Leonard plays the opening bass and Mark Cobb sits in on the drums. The rest of the material is the result of Bruce's handiwork. Sonic flares shoot from the synth and saturate the darkness of night. The bass bounces with the weight of a bowling ball while the drums add a rudimentary rhythm. Before he closes shop, Bruce surprises the listener with a lax and loose guitar solo. This song has the same flamboyance as the first. Mark continues drumming on one more cut while Tim Eagan pinch-hits on the bass. This dawdling ditty slowly decelerates as the gravity chamber is set to its heaviest setting. With this pressure pushing down from above, your feet stick firmly to the floor. You struggle to free yourself from its invisible hold, but efforts are futile when it comes to escaping the attraction. No drums are to be heard in this hollow compartment, but the collective of magnetic material creates quite the formidable force. Holmes (that's the name credited) is responsible for the ambient sounds coming from the second solo synth. Kate Jenkins contributes the bass. Bruce's guitar and synth fill in the rest of the vacuum. Adam Stockton opens this one up with a playful drumbeat. The song is slow and awkward as we spend the majority of time setting up the plot and waiting on character development. Don't change the channel. After this episode gets underway, it has the most intriguing premise. Q-Bert hops along the squares as he attempts to avoid Mr. Coily (the evil purple snake in the classic arcade game). Jim Wert appears on the board with a series of strange weapons that consist of a didgeridoo as well as some additional artillery. Once the easy screens are completely conquered, it's all action from here on out. Watch out for Wrong Way and be sure to utilize the flashing spinners. After two passive pieces, this one really picks up. Bruce's guitars slash and scream as they run rampant through these melodic mazes. This is one of the more entertaining pieces, as it's crammed with arts, crafts, and all kinds of challenging stimulation. It also has the most participants. Brad Wegner brings in the bass, Scott Edwards shines on the drums, Mike Fiorentino is vibrant on his electric violin, and Andrew Stoeckley is no stranger when it comes to his solo on the synth. Holmes is also back at it again with his very own synth riff. The fog rolls in before the traffic fully materializes. Frogger hops across the highway trying to avoid an onslaught of maniacal and ornery drivers. With each jump, he's closer to his goal, but the beat becomes significantly busier. Cars zip by while trucks take their time. Many of the melodies motoring past your senses are short while several are rather squeaky. Some slowly lurch and some move quickly. When this unusually ambitious amphibian makes it over to the perilous pond, the keyboards drizzle and drip. These sounds make a dangerous distraction as many of the pets in this pool spontaneously lunge and snap. If this creature is not careful, he might land in the mouth of a gator or slam face first into the flat rigid surface of an unforgiving wall. The yellow animated freak has just gobbled up a big fat power pellet. He's high on speed and hungers for a banquet of tasty blue ghosts. With each poltergeist that he pops, a set of eyeballs float to the center square. It's both mysterious and creepy. Your anxiety will be on the edge, but as long as the screen is flashing, you're in total control of this contest. Helping out our hero is David Cook and Harry DeCourcy. Both provide percussion. Additionally, David donates a cool bass riff at the beginning. Bruce White is a pinball wizard who racks up the score with an album that is efficient, pristine, and tidy. 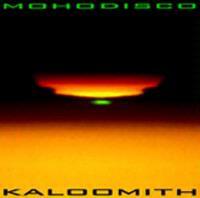 Mohodisco is the kind of music that would fit flawlessly into the theme of an action-packed videogame.